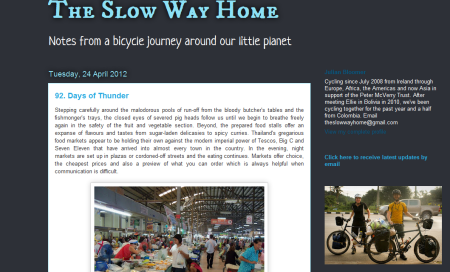 The Slow Way Home: Julian Bloomer on the road since 2008 – Go Bicycle Touring! 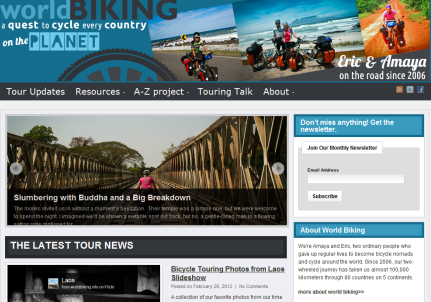 I can’t tell you how many people write to say how surprised they are to discover so many blogs from people who are cycling around the world. Well, here’s another one, folks! And this one’s a real ride around the world. Julian Bloomer set off from Ireland in July 2008 to cycle to Cape Town. Somewhere between Benin and Botswana, he became captivated with the idea of cycling each of the continents. After his ride through Africa, Julian set off cycling through South America and he still hasn’t stopped spinning his wheels. In 2010, his tour changed dramatically when he met Ellie Beck who was backpacking through Bolivia at the time. Ellie traded in her backpack for a bicycle and the two have been cycle touring together ever since. The duo is currently riding through Southeast Asia. Julian’s blog posts give you great insight into the daily life of a cycle tourist and often focus on broader social and political issues in the countries in which he is travelling. We arrived groggily back to the mainland on the night boat to Surat Thani, stumbling onto a deserted pier at 4.30 a.m. and setting off through the city while the monks collected their alms. In a couple of days we crossed the peninsula to the west side and the Andaman Sea. Through tropical cash crop plantations of rubber, coconut and palm oil. The sweaty grind being rewarded with friendly locals and fiery curries. Sitting outside the market in the village of Thap Put, our German friend Patrick rolled up and we camped together in a nearby temple where the monks gave us a couple of wooden cabins for the evening to lay down as well as presents from their morning’s alms including mineral water and soya milk. We chatted in the dark while the rain fell and woke up at 5 am with the morning’s prayers being broadcast on loudspeaker. As we handed over a small donation, we were given rice desserts, sandwiches and tea to take with us. And south we went. Patrick said goodbye for the third time in a few weeks as a rain cloud burst overhead as he headed to the climbing mecca of Railey and Ellie and I rode past the forested limestone outcrops into Krabi for day’s rest before continuing on over the Malaysian border in a few days time. Many thanks for putting the blog on GBT. Good luck in Borneo!